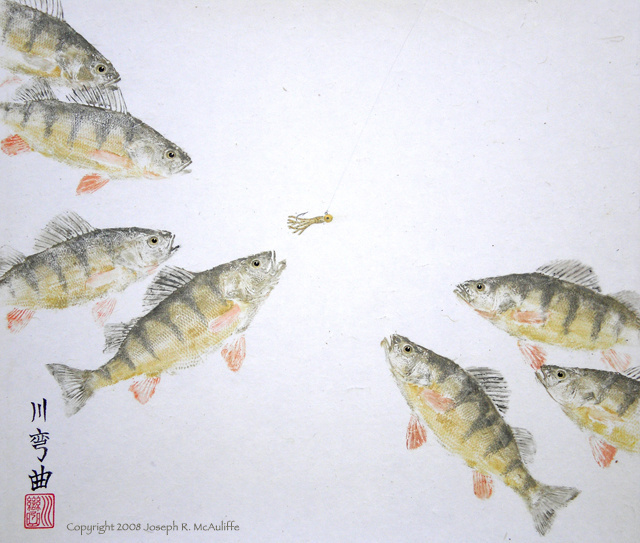 A a tiny jig focuses the attention of a few yellow perch. The nearest one inhales the bait and dashes away, only to be halted and retrieved by the nearly invisible line. The underwater commotion attracts more yellow perch, and with every one reeled in, the number of newly arriving fish multiplies. Eventually more than a hundred perch gather beneath the rowboat in the crystal clear water, waiting for their turn to attack the irresistible lure. As each new fish is reeled in, the entire pack follows the one tethered to the line to the top, seeking their own piece of the action. My 9-year old daughter, Lillian, was thrilled by the constant tug on the line and the sight of so many lively, colorful perch swimming beneath her. Youngsters grow impatient if the time between catching one fish and the next is too great, and Lily is no exception. So I seek fishing adventures that will capture and hold her attention in order that she will experience the excitement of catching fish after fish in rapid succession. With such fast action, Lily’s attention was focused entirely on fishing – there was no time to be distracted by anything else. She laughed and squealed with delight at the solid pull of a fish on her line along with scores of perch following her catch to the water’s surface. Fishing is usually not so fast and furious, and with time, I trust her need for such uninterrupted excitement will mellow into more patient and calm ways of achieving a fulfilling point of focus.